How is a band gap relevant to the design of photovoltaic materials? The band gap of a material determines what wavelengths of light a photovoltaic (or any other) material can absorb. Photovoltaic materials need to be capable of absorbing the wavelengths of light that the Sun emits, and this requires that they have a band gap that spans the appropriate range of energies. 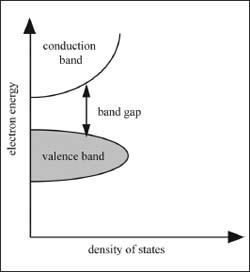 A sample graph showing the band gap of a material between the conduction band and the valence band. The smaller the gap, the better the material is for conducting electricity.